Photo: David Meyer, Streetsblog NYC. A few years ago, New York City showed us the power of vision. These days it shows us the power of persistence. As we whittled our annual list of the country’s best new bike lanes down to 10, we had to make a few painful cuts. One of them was New York City’s Chrystie Street. But the most remarkable thing about Chrystie deserves a post of its own. As reported last week by Streetsblog NYC, there is now a continuous nine-mile northbound bikeway from downtown Brooklyn across the Manhattan Bridge, up First Avenue and over the Willis Avenue Bridge into the Bronx. 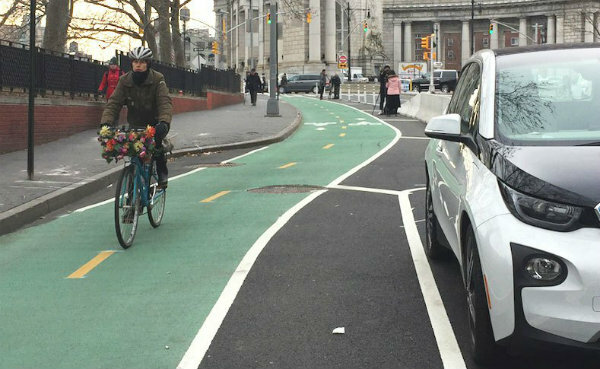 That’s thanks to the biggest year yet for new protected bike lanes in the city that is undisputably the nation’s protected bike lane leader: New York. Three years ago this week, Trottenberg’s revolutionary predecessor Janette Sadik-Khan left office, leaving the city’s transportation system with an uncertain future. At the time we wrote that even in New York, a city that has arguably been hurt more than any other in the country by overreliance on the automobile, it’s still possible to build new Amsterdams. Under Trottenberg (and by extension her boss Bill de Blasio), NYC DOT has unexpectedly shown how most progress happens: Not only with dramatic flourishes but also with diligence, patience and — once in a while — a moment of major payoff.